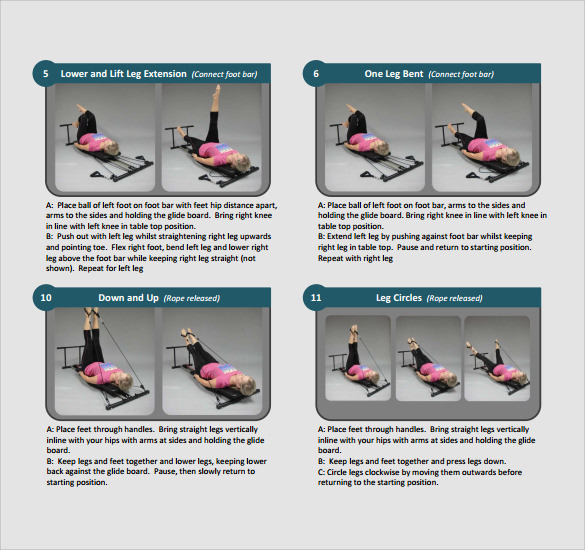 An Exercise Chart enables you to keep a record of all the exercises you intend to do in an efficiently managed table so that you can monitor your physical routine at ease. The distance you walk daily can also be maintained in such tables to see exactly how many calories you burn with your routine. You may like Height Weight Charts. A chart helps you to define easy goals and follow them. A column for notes and intensity is also created for you for future references. You can now use these available templates to create highly customizable exercise charts and download them in word and PDF format right here. You can also see Fetal Weight Charts. 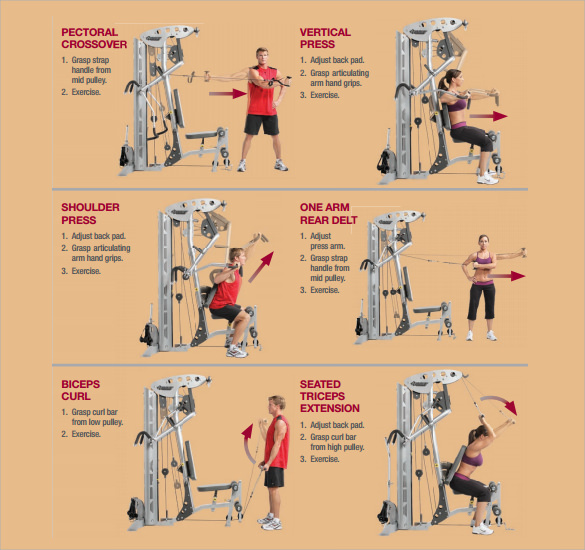 This sample of workout charts printable sample is a template where a number of exercises are given which makes use of body blades. In these series of exercises the body blades are used for the purpose of strengthening the core. Besides providing a pictorial representation of all the exercises, this template also provides clear instructions about the postures, which in turn would prevent any wanted injuries. 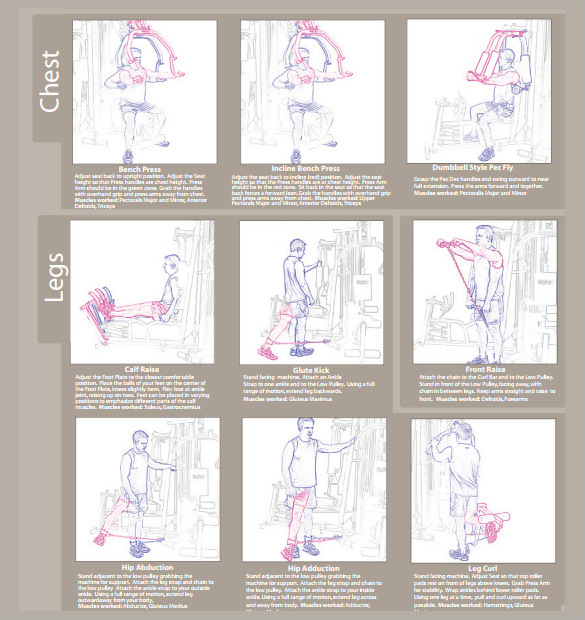 This sample of exercise chart PDF, lays a great deal of emphasis on building muscles. This chart makes se of only one machine. 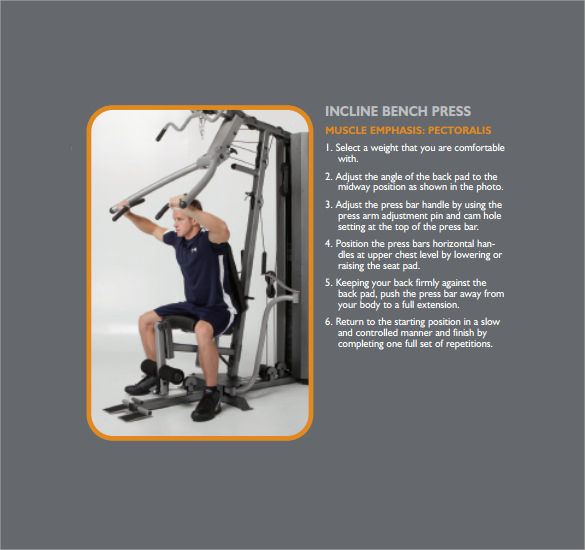 Detailed instructions are provided for different type of muscle building exercises like bench press, shoulder press and various other types of curls related to arms, legs and back muscles. 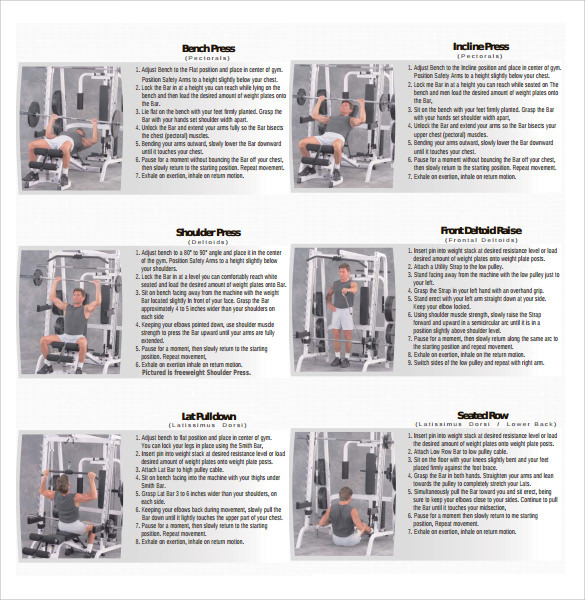 This sample of fitness chart template makes use of an exercise fall for practicing different types of exercises to strengthen different types of muscles in the body. These exercises are divided depending upon the degree of difficulty. 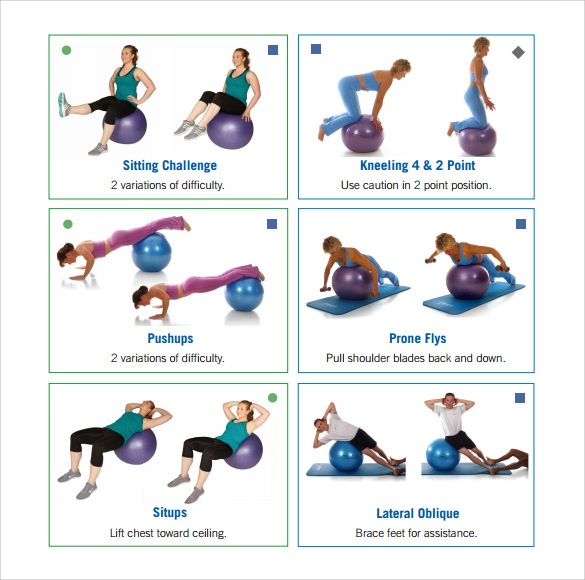 The template lists down the advantage of working with an exercise ball and how it can help a person from every age group to stay fit. What Is The Best Exercise Plan For Me? Building a workout routine completely depends on how much time you are able to devote to exercising and what your end goals are. The second most important thing to ask is where you intend to work out and what would be your preferred style of exercising. You may also like Process Chart Templates. Once you have figured out these questions it is important to know that different exercises have different impact on different parts of the body. So mindful of what you are choosing and how many repetitions you need to do achieve your goal. Lastly keep a track of everything you are doing and write everything down as it would help you to work better. How to Build a Personal Workout Schedule? Building a workout schedule is very important as it ensures that you do not miss your exercises even if you are super busy. As a first step select a time, which you think would be ideal for exercising. List down all the important obligations and see how much time you can squeeze for exercising. You may also like Blood Pressure Chart Templates. If you do not have time to hit the gym, schedule 30 minutes of cardiovascular exercises at your home. If you want to burn more calories in a shorter period of time, you can try doing intensity workouts. Whatever pattern or plan you choose, make sure you stick to it and repeat it week after week. What is The Importance of Workout And Physical Fitness? Physical fitness is not all about building muscles or getting a size zero figures. Physical fitness is important to ensure that you remain both mentally and physically alert and have a good metabolism along with a strong immunity, which can help you to fight deadly diseases. You can also see Hospital Organizational Chart Templates. A physical fitness chart is a great tool to help you to get started with your own fitness routine. It has detailed diagrams and instructions which can be very useful for a beginner. You can follow one of our charts and choose from a diverse range of exercises from a wide range of activity and enjoy a healthy and fruitful life.